I was wrapping a few presents the other day when it occurred to me that I’d taken care of our primary gift for Maddie and C9, but not for Katie or Millie. Katie was easy to fix. Millie? Not so much. She likes movies. That’s about it. I found the movie Up for about $10 last week and it is now on its way to our house. Doesn’t seem like that great of a primary gift, so today I looked at my growing stash of cool fabric and decided to make her a movie watching quilt. Here it is in its pre-washed glory. I LOVE it. Love it more than the picture shows even. It’s going to be smashing after it gets washed and looks more quilt-ish. I plan to wrap it with the movie in the same box. You astound me. I have been working on the same quilt for Little since she was 19 months old and she’ll turn 6 in February. You decide to “make a movie watching quilt” and wah-lah! I bend my knee to you, oh queen of the multi-task. I LOVE this!! The fabric is so great. 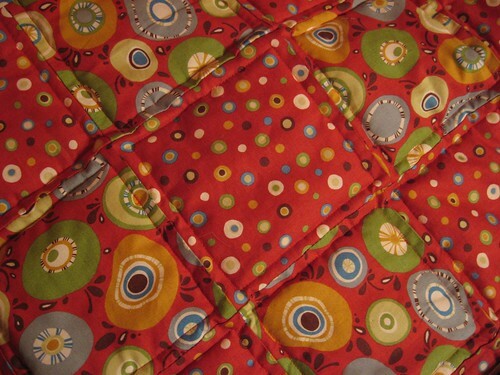 I’m hoping to make quilts for our babies – if there ever are more than one. You have such great fabric-picking skills. This is great! I bet she’ll love it. I love giving my kids gifts made by me with love. I’m with everybody else, too. I LOVE this! She will, too. How hard was it to machine quilt? I’ll need lessons. Lovely! And Up is such a great movie. I’m really enjoying your photos by the way, and love.love.love the new blog look. Good job! Blessings and Merry Christmas, Megan. B.
Swoon! You have the best taste in fabric. Megan…Yea! A pic – thanks! I shouldnt be but I am confused as to how you made that. Did you sew blocks first and then sew them together? You didn’t use sashing. My mind gears are humming….help me. 🙂 Love the quilt! Love the fabric. VERY easy to do. I just cut blocks and alternated them. Sandwiched the batting between the quilt top and a coordinating backing (though not quilted), machine “quilted” each block and then hand sewed the binding on. Oh, I’m a sucker for a quilt. Nicely done, much better than a movie.